A few weeks ago, I went to New Jersey with the primary idea to shoot at night and visit some fellow night shooting friends. To most people who know NJ, you wouldn’t think that Newark, Bayonne, Harrison or Jersey City are photogenic, but I’d argue that point. I’ve always been attracted to photographing the man-made world. It’s not that I don’t like the outdoors and camping–on the contrary, I do, but I find there are others who shoot it better than me. My take is to enjoy nature in real time, not so much photographically. The urban-industrial city is simply accepted and taken for granted. Especially at night. The eastern part of NJ bordering NYC is very man-made and urban, and has been for many generations. On our first night out (I arrived at 6pm) we shot close to where I was staying in South Orange to start thinking creatively. 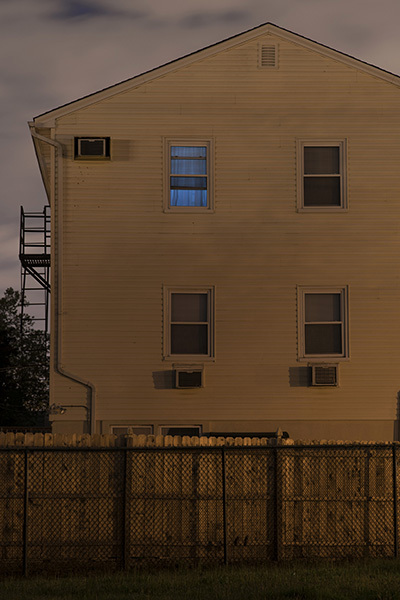 We were shooting in a local park when I saw the TV flickering from this upstairs window. The blue glow contrasted nicely with the orange sodium vapor lamps in the park, telling the story of home life after work. 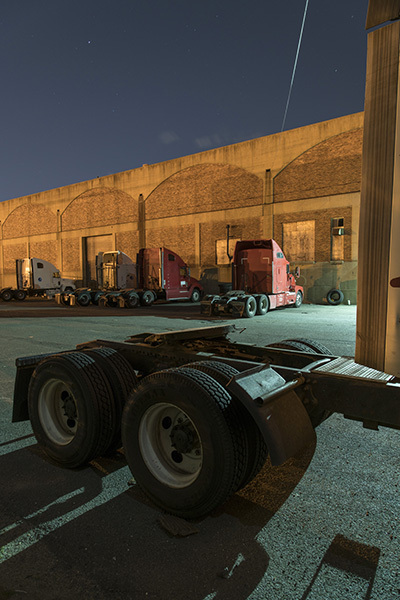 We went to the Port of Newark’s cruise terminal to explore the new and old areas, which are changing rapidly. The above is a shot of the staging area tent and the near full moon. 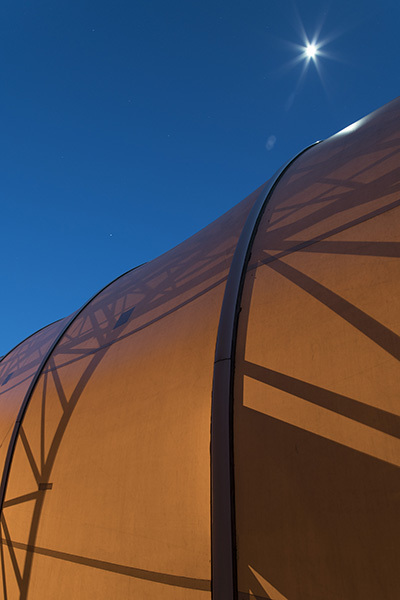 What you are looking at is the orange sodium vapor lamp shining through the white plastic with the shadows of the internal structure on the tent itself. I found this so abstract and shot about half a dozen views before I got this view. Getting the reflection of the moon was a challenge, as there was a brick wall behind me limiting my options. 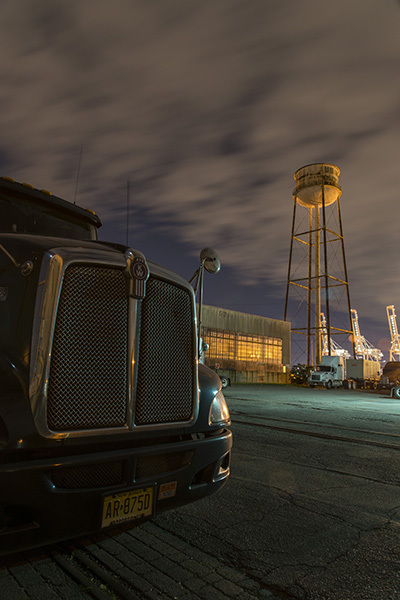 There were some fast moving clouds near the Port of Newark on this cold, blustery night. The near/far relationship between the truck an the background gives interest and scale. This is the same water tower that was in the previous shot. For this shot, the water column was selected in LightRoom as the “neutral” color, eliminating the orange cast of the earlier shot. I liked the metal building’s cyan color rendering. The other shot is more what it looked like to the eye. I don’t do this often, but a shot like this opens it up to different interpretations. The hard shadow from a security lamp made for some interesting shadows and colors. That is a power line, not an airplane in the sky. Note the wisps of clouds and just a few stars. You don’t see many stars in the well lit, crowded urban areas. 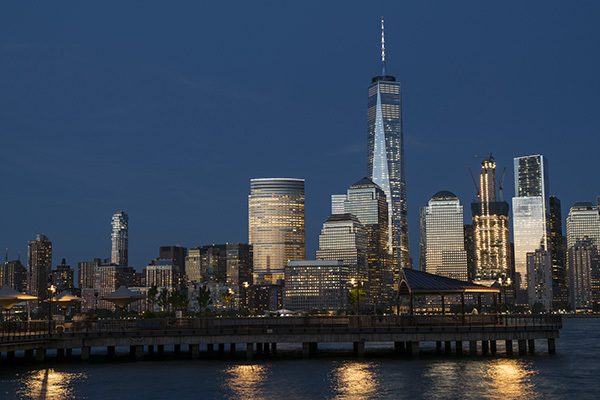 Here is a twilight “beauty shot” of the Manhattan skyline from Jersey City. It’s so close (minutes by water taxi) but also so far away. The NYC skyline has changed so much in the past 20 years. I included this to show many of you that I shoot more than industrial areas! We went shooting down by the Hackensack River of the new highway bridges being built. I shot many shots of that construction, but I found the texture of these pilings more photogenic. The water is murky in this industrial part of town, with a power plant on the right out of view. 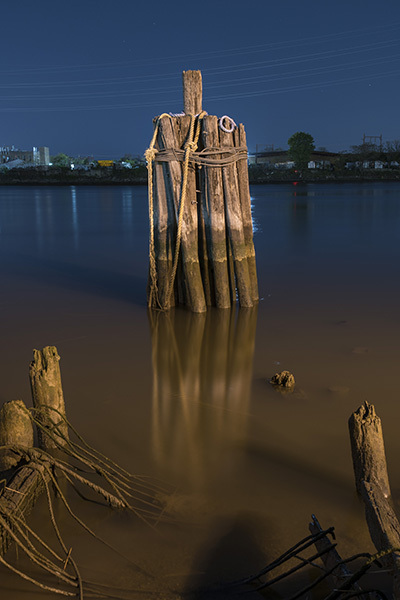 The long exposure of 1 minute smoothed out the ripples in the water adding a nice tone to the brown to blue water color and reflecting the pilings. When traveling by train into Manhattan, I’d use my phone’s map to see where I was and make note of interesting areas to explore in the evening. 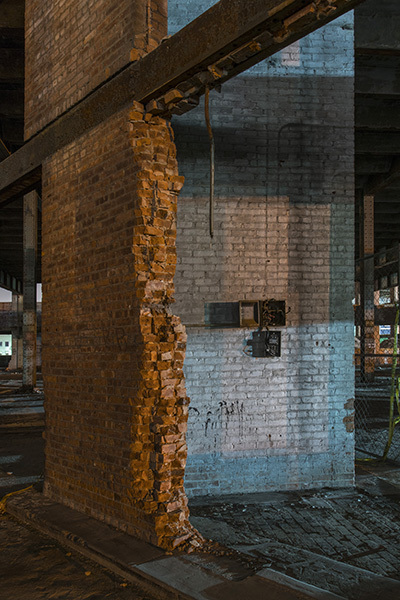 The 19th and early 20th century brick factories are rapidly being torn down (or on occasion, being rehabed), changing the landscape of places like Harrison. It’s becoming quite gentrified! The above factory has been gutted and turned into a parking lot–at least for the time being. I’m sure it will be gone the next time I come to Harrison. 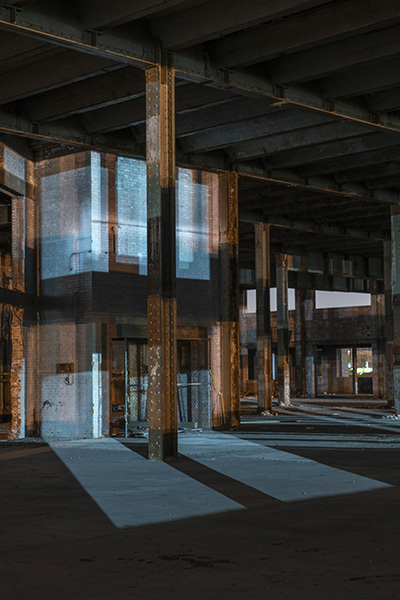 We wandered around this area of old abandoned factories and found one that has been recently been gutted. Everything of value has been stripped. It was open on one side, so we went in to explore. 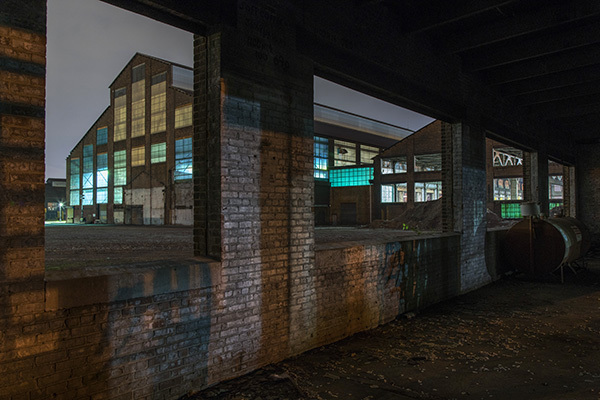 There were bright mercury vapor security lamps shining through the gutted windows on one side, casting an eerie blue color cast on the red brick. In this shot you can see those intense blue lights in what seems like projections on the walls. I shot quite a bit in this location, as there were no fences to climb or windows to climb through. I know this structure will be gone soon despite being over 100 years old. As I was shooting I saw a flash of a spotlight coming though the building. It was the police making their rounds. We both hid in the shadows as they made a slow drive by with the spotlights. We were not seen, allowing us to shoot for a while longer. I should mention that the Red Bull (soccer) Arena is just two blocks away from this location. I figure they can make more charging big money for parking than what the factory could produce. Times change, indeed. 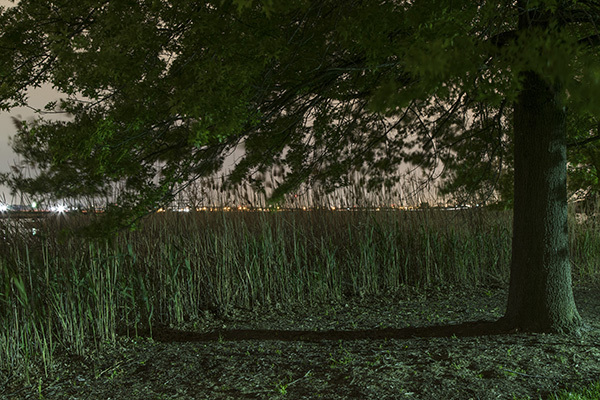 I really wanted to shoot in the Meadowlands, showing the “nature” side of NJ. After all, it is the Garden State! With some time spent on Google Earth Satellite view, I found a nature preserve in Lyndhurst called DeKorte Park. It’s less than a mile from Kearny and Jersey city, yet the locals I was with never heard of it! It was closed at sunset, but there was an open gate you could walk in and we explored on foot. It’s actually built on a closed and capped landfill. This image is lit from some green security lights with the Meadowlands beyond. I shot quite a bit in the park as it had a boardwalk through the swamp-lands. That’s a duck blind on the right. The lights of Manhattan are just four miles away in the background. It was a dense overcast night and it actually rained on us a couple of times. I had to duck into the duck blind for a while. It’s really a hidden gem that I would come back to often if I lived there. Thanks, Don, and glad you enjoy it. Nice work, Tom. Thanks for keeping me on your list. Great to hear from you and glad you enjoy the blog. I always wonder how many people actually look at it. Beautiful images. I’ve hunted ducks in a lot of places but never under high voltage power lines. How did you manage to shoot all those pictures without gettin a dead body in the frame? Ok enough with digs at Jersey. It never looked better than through your viewfinder. NJ and especially when in the Meadowlands at night, I watch who I might be stepping over. It certainly has that feeling, as so many people dump all sorts of things out there. I wouldn’t worry about it; nobody goes to the Meadowlands at night unless it’s their job to be there. Never been scared then, and have been photographing it since the late 80s. Thanks for commenting. I would shoot it regularly if I lived there. Wow. Certainly a different view of NJ than I have memory of. Very creative shots. Well done, again, Thomas! I was not far where Richard and Mary, and Aunt Rose used to live. Glad you enjoyed them. Very thought provoking night shots, Tom! I love the Manhattan skyline. 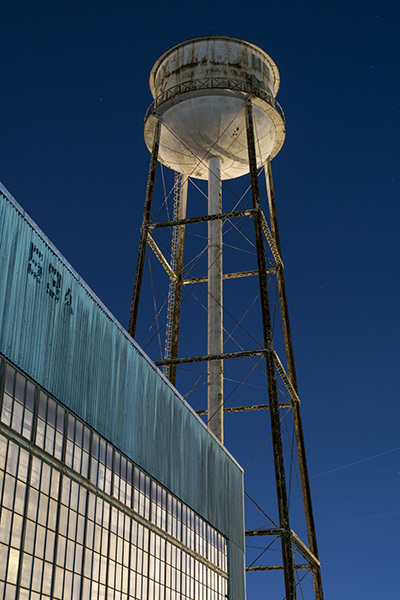 Northern NJ is ripe for your night-time industrial photography, Tom…I was there in May and it hasn’t changed much! Lots of things to shoot, for sure. It’s actually changing rapidly with gentrification. Many warehouses and factories are coming down for condos and live-work spaces. Former Manhattanites are realizing you can live in NJ with one or two train stops into Manhattan, yet it’s relatively affordable. As a former NJ-ite, I was thrilled to see these photos, especially since my father’s warehouse was in Kearny. Beautiful photos, and fascinating history there too. Thanks. I shot in Kearny this trip, too. My uncle lived there for many years until he retired to SC a few years ago. 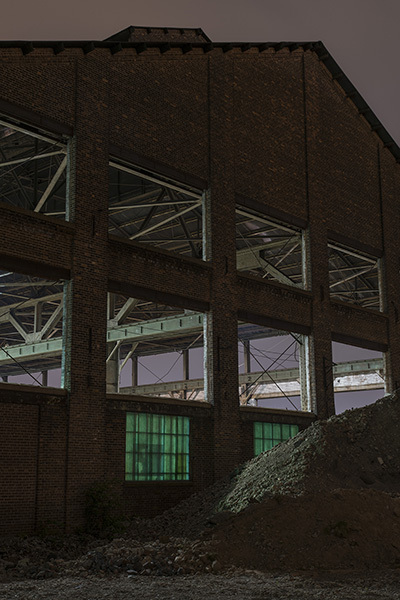 Lot of gritty warehouses to shoot there. Thanks for your comments. Really great set of images. While your use of mixed light is always beautiful, I kept thinking of how I was going to show my students your strong use of scale and leading lines! You make my birth state look good… And better than what I remember from the last time I was out that way. I’m looking forward to seeing those Edison images on a future blog post! I think NJ is more interesting at night. The “Garden State” doesn’t seem to have many gardens. Another posting of gorgeous, elegantly composed photographs made in your trademark style – along with a thoughtfully well-written and informative text. Bravo, Tom. Many thanks, Mark. 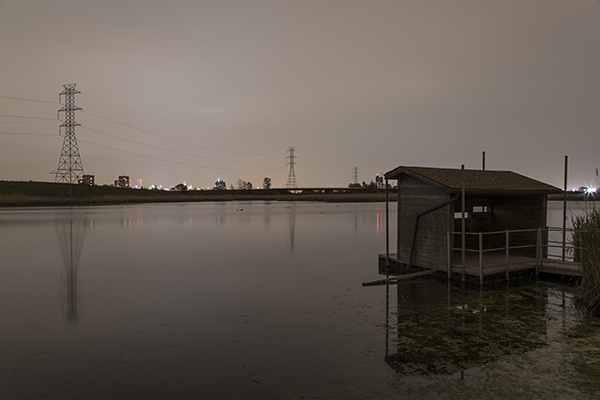 Who would ever think of shooting the Meadowlands? I found it inspirational. I live next door and never thought I would ever go to that part of NJ at night. Maybe now seeing these wonderful creation of yours I would think of making the trip. I like the 3rd and 4th from the last, the color and graphic compliments each other. Few others would think to go there at night either. That’s why there is no one there! I found it peaceful and conducive to making images. Wish I had more time there. sorry for the late response- July was an extreme busy time- your images are wonderful- as always- amazes me that we were in the same places shooting at the same time and yet our choice of images so different! That’s the fun and art of photography. We all see so differently.